3rd Brake Light Overlay Decal 05-08 Dodge Magnum 3rd Brake Light Overlay Dodge Magnum, Dodge Magnum 3rd Brake Light Overlay, Dodge Magnum 3rd Brake Light Cover, Dodge Magnum 3rd Brake Light Decal, Dodge Magnum 3rd Brake Light Tint, Dodge Magnum Decals, Dodge Magnum Tint, Dodge Magnum Decal Overlay, [3SP Magnum 3rd Brake Overlay] - $14.95 : 3rd Strike Performance, Your Source for Late Model MOPAR Performance Parts and Accessories! Make your Magnum stand out! 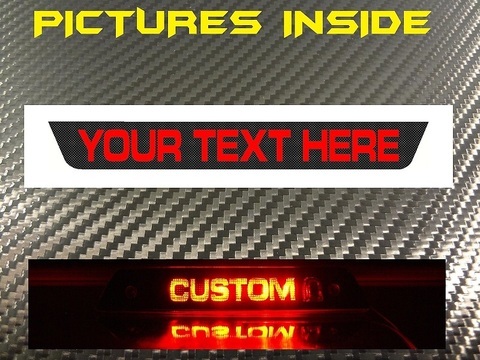 Our 3rd Brake light covers are custom made with your choice of logo! We make these to order, so you can put what you want on them (as long as it fits..). Order your decal today and make your Magnum outstanding! Easy to install and easy to remove if you ever need to without damaging your lights. This are vinyl overlays which cover your lights and are ready to install. Note: Unless you take your lights out and paint the edges, there will still be a slight edge of light around them. This is unavoidable due the shape of the lights.